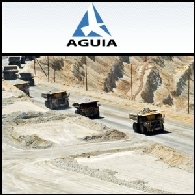 Aguia Resources Limited (ASX:AGR) is focused on the exploration and development of phosphate and potash projects in Brazil. 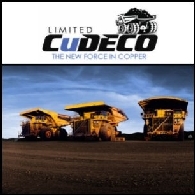 Brazil is Latin America’s biggest economy and is heavily reliant on imports of up to 50 per cent of its phosphate and 90 per cent of its potash needs. Aguia is well positioned to capitalise on the growing demand for phosphorus and potash based fertilisers in the expanding agriculture sector in Brazil and controls three large projects, located close to existing infrastructure. The Company is committed to its existing projects whilst continuing to pursue other opportunities within the fertiliser sector. 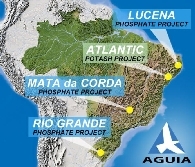 Phosphate and potash exploration and development company Aguia Resources Limited (ASX:AGR) is pleased to announce an operational update for its projects in Brazil. Over the last two quarters, the Company has completed drilling programs at both its Tres Estradas ("TE") Phosphate and Atlantic Potash Projects. Results of these programs are summarised below. 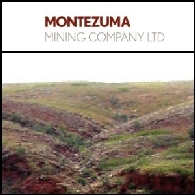 Asian Activities Report for November 15, 2011 includes: Montezuma Mining Company Limited (ASX:MZM) says today that further assay results from the recently completed drilling programme at the Butcherbird Copper Project have returned further high grade copper results; Universal Coal plc (ASX:UNV) has received all large diameter drill sample analysis and test work for Berenice-Cygnus Coking Coal Project; Guildford Coal Limited (ASX:GUF) announces an initial JORC resource estimate for EL13780X in the South Gobi Coal Project of 63.1 million tonnes; Aguia Resources Limited (ASX:AGR) has received excellent drilling results from the TE project in southern Brazil. Asian Activities Report for July 7, 2011 includes: CuDeco Limited (ASX:CDU) said today that FIRB has approved Oceanwide International Resources Investment Co. Limited to increase its shareholding in CuDeco to 19.9%; Aston Resources Limited (ASX:AZT) announced the completion of its definitive feasibility study for the Maules Creek coal project; GBM Resources Limited (ASX:GBZ) has identified previously undiscovered Rare Earth Element and Yttrium mineralisation at the Milo Prospect in northwest Queensland; Aguia Resources Limited (ASX:AGR) has signed an Option Agreement to acquire 100% of two potentially large-scale phosphate projects in southeast Brazil. Asian Activities Report for April 4, 2011 includes: Aguia Resources Limited (ASX:AGR) has commenced drilling at the Lucena Phosphate Project in Brazil; NuEnergy Capital Limited (ASX:NGY) has been awarded a third coal bed methane Production Sharing Contract in Indonesia; Elemental Minerals Limited (ASX:ELM) announced its maiden Mineral Resource estimate for the Kola deposit in the Republic of Congo; Solimar Energy Limited (ASX:SGY) secures control of a large shallow oil field in the US. Australian shares fell for a second straight session on Thursday as investors were disappointed with the US existing home sales data and not expecting any inspiring results from new home sales. 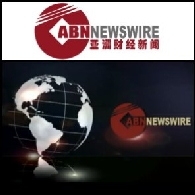 The benchmark S&P/ASX200 index lost 72.2 points, or 1.6 per cent, to 4486.1 points, while the broader All Ordinaries index was off 71.9 points, or 1.6 per cent, at 4509.4.